Diary of an Advertising girl: Sober? Then piss in a straight line! Brilliant Romanian anti-drinking and driving advert by Mercury 360. 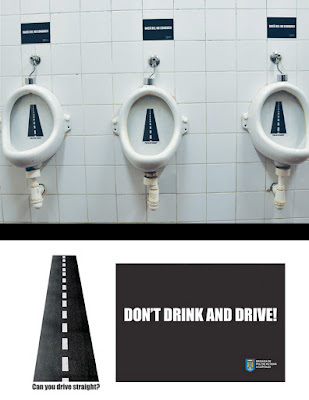 These ads were placed in the busiest mens' rooms in Bucharest. My only comment is that surely men can never piss straight. Otherwise they must be peeing all over the seat and floor on purpose! Men! Is that true? Or are all the men I know pissed all the time? Well, in any case Romanian Police say that most of you are unfit to drive. Big up to Copyranter for finding this ad. AHAHAHAHA this made me giggle. And yes, it must be on purpose that they pee everywhere...do they ever clean after doing it...?